Construction of the new Orient Express Chairlift (not the official name but it heads up Orient Ridge) or perhaps Orient Chairlift is underway, and is the next announced phase of the 2018 Sun Peaks expansion plan which will see over $30 million in new investment over the next 5 years. It opened at 8:30 on Monday, December 24th, 2018 as promised. It comes at a cost of around $4 million and is expected to be operational by the end of December, 2018, even though the late departure of spring and all the excess snow melt and run-off caused some construction delays, and snow and cold temperatures arrived early in October of 2018 . The new four passenger fixed grip chair, similar to the Elevation chairlift, will be at the base of Mt. Morrisey near where the Umbrella Café sat, but will take skiers in the opposite direction, up and over the overpass, along the 16th fairway of the Sun Peaks Golf Course (Mt. Morrisey Connector route in winter) between Trapper’s Landing, Stone’s Throw and Trail’s Edge, and arriving at a point above the East Village Skiway, with an elevation of 1,525 meters (5,003 feet). From there, skiers will now have a direct route back to Sun Peaks Village via the Main Village Connector that will lead to the Rambler Trail between Three Bears and Peek-a-Boo, with an easy grade of not less than 2%. Turn the other way up top, and you can ski down the existing runs off the East Village Ski Way, or head straight down the newly-added run directly under the Orient chairlift, called Hasta La Vista. While it will start as a quad, there is an expectation that it may be extended in the future and changed to a 6 pack, all depending on demand. The existing Umbrella Cafe and small washrooms are being moved further east towards the Nordic ski center to facilitate the drive station, and P5 will be cleared out to make room for the extra day skiers. Click for the official Sun Peaks Orient Ridge Chairlift announcement. Skiers should be able to gain access to a number of relatively unused blue trails that frequently offer great stashes of pow along with gladed areas, such as Carpe Diem, Chikamichi, Ca M’a Fait Plaisir, Fair Dinkum, Czesc, Ausfahrt, and the new Hasta La Vista run below the lift. These trails lead to the Morrisey Connector, which then brings skiers back to their choice of the new Orient Express Chairlift or the Morrisey Express Chairlift – both great options. 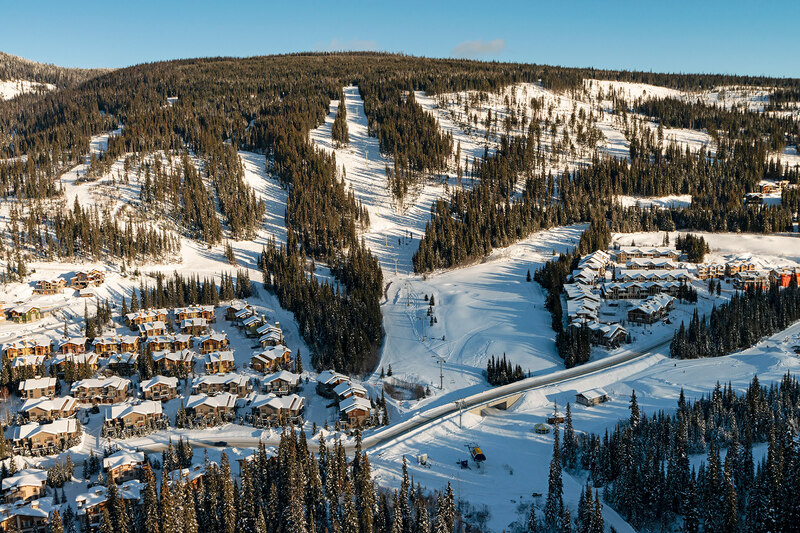 This is fantastic news for guests of our BestSunPeaks Stone’s Throw condo or our BestSunPeaks Trapper’s Landing townhome, as well as those in Trail’s Edge, McGillivray Creek, Settler’s Crossing, Echo Landing, Woodhaven, Lookout Ridge homes, etc. 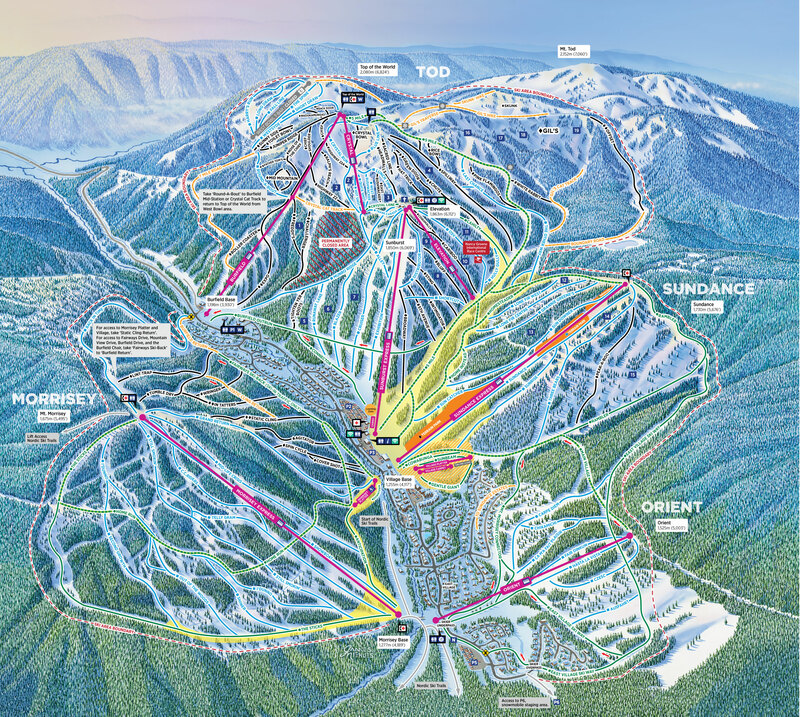 Ski-in/ski-out options from the East village area are now even better! It will also make access to skiing much easier for day visitors who need to park in P5, which will see big increases as the number of skier visits continue to rise, and the new Sun Peaks hotel and commercial building begins construction in the parking lot in front of the Village Day Lodge. Also in time for the 2018/19 winter season, will be the addition of additional chairs on the Sundance Express chairlift, increasing capacity by 30% to the great runs on that mountain, along with to the Rockstar Energy Terrain Park. More chairs will of course mean even less time spent waiting in line! 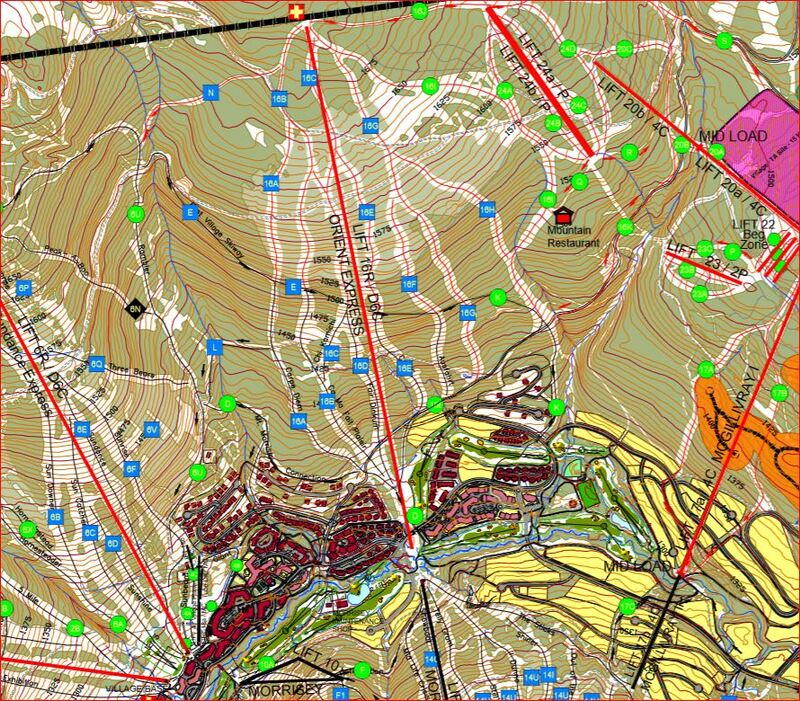 These improvements are all part of the Sun Peaks Resort Master Plan (above image copied from the Sun Peaks Master Plan) and are part of the Sun Peaks planned expansion of the East Village and related services. With it will come additional Sun Peaks real estate options, new services, and more parking with easy access to the village.